Got questions about dental implants? We’ve got answers! Read our FAQ below -- and don’t hesitate to give us a call with any others you may have! 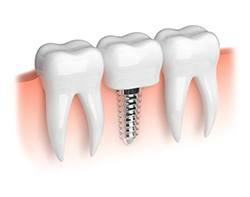 Dental implants work by replacing a missing tooth’s root as well as its visible crown. The implant post is made of titanium, a material that promotes the growth of bone tissue to ensure excellent stability. In this way, dental implants create a strong foundation for the replacement tooth/teeth that are affixed on top. What is the dental implants process? The dental implant procedure is completed over the course of two major phases. First, the implant post is placed beneath the gum line. Then, the prosthetic crown/bridge/or denture is affixed to the implant posts. 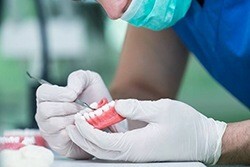 There is no fixed price for dental implant procedures. 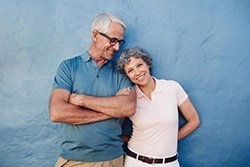 The cost varies based on several factors, including the health of the jaw bone, how many dental implants are being placed, and other considerations. You will need to schedule a consultation with our office to get a good estimate of the cost of your dental implants. How does one properly care for dental implants? Dental implant maintenance includes excellent oral hygiene and routine visits to the dentist. 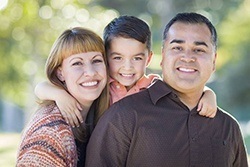 Make sure you brush and floss your teeth as recommended and attend all regularly-scheduled appointments at our office. With proper care, your dental implants can stay healthy and function properly for a lifetime to come! Just like the name implies, mini dental implants are a smaller version of traditional implants. They can be used in particularly tight spaces or when there is not enough bone structure to support a traditional implant post. What is a single tooth replacement option? In the case of single tooth loss, an implant-retained crown can fill in the gap while protecting the teeth around it. What is a multiple tooth replacement option? In the case of multiple missing teeth, an implant bridge or implant dentures offer a beautiful restoration option.